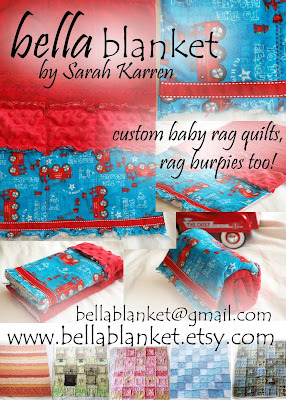 Sarah from Bella Blanket creates the most beautiful rag quilts I've ever seen and I'm so excited to show her off on Love Actually during "Then Comes Baby" Week! Her handcrafted, boutique-quality rag quilts are created from flannel, minkee dot, chenille, terry cloth, and other soft and beautiful fabrics and are the perfect size for on-the-go or to wrap your baby in for snuggling! 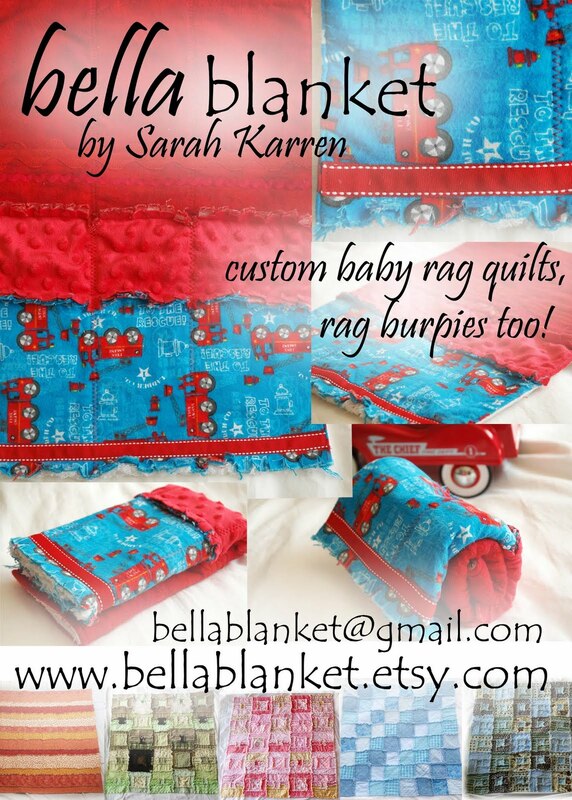 Her creations don't stop at rag quilts, she also makes gorgeous baby jewelry and rag burp cloths, Bella Rag Burpies. Today, she is offering one lucky follower this "To the Rescue" Bella Rag Burpie. 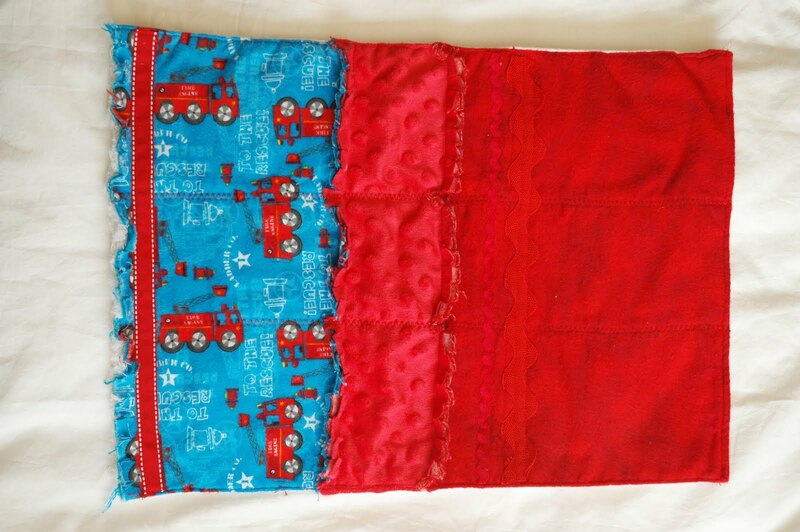 I love the cute fabric she has used and hope it will come to the rescue one of you moms soon! Those are cute! I voted, maybe by tomorrow you'll be #2!!! Check, Check, and Check! Her stuff is darling!! Too cute to be burped up on! Good luck with the votes! I love this site. And these blankets are stinkin' cute! I voted for you! Love your blog and that burpie is so sweet!! Cute Etsy shop. My favorite is the Blue Daisy. Do they make those blankets in my size!?! I want to curl up in one too!! I am a follower and I checked out her shop. So cute!!! Too cute I love this burpie. Follower, voted, and checked out cute shop. I am a follower and I voted! I'm following and I voted! I love her etsy shop, especially the ladybug quilt! So cute! I would love these rags! So chic! Your giveaways are so awesome! This would be so perfect with our little man on the way. I'm following, the etsy shop is so adorable!! and I voted! I hope you win! All three - DONE! :) Love her Blue Daisy blanket. I have done all three. I like her giraffe blankie! I love rag quilts! I checked out the etsy, follow, and voted. I follow you! This is such a fun week because my husband and I just decided to try for a baby!! This blanket is beautiful! Even if I don't win... (I hope I do!) I think I will bookmark her etsy shop! Way cute and fun!! 2. My favorite thing in the Etsy Shop is the Blue Daisy quilt!! 3. I voted for you!! I love the owl rag quilt...very sweet. I follow your blog!! And I have voted for ya!! Good Luck!! Of course I voted for you! Thanks for the giveaway! This is adorable for a little baby boy!! And I'm a follower!! Such cute blankets! By the way, while I follow your blog and always love the ideas you (and others) post,I love that you're having this theme this week. so appropriate! :)The blankets in the etsy shop were adorable and oh so snuggly, I wish I could snuggle up in them too! Voted for you, good luck! I did all three - what a VERY cute etsy shop Sarah!!! I love the blankets!! I am a faithful follower! I love Sarah's etsy shop items! I especially love the baby bracelet! I follow you and I voted. I love her quilts - they are sooo nice! I LOVE it! 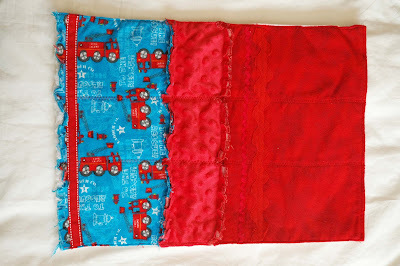 I am decorating my baby's room in Fire Trucks. I would love this Bella Rag Burpie! she has such cute stuff deff want to win! I follow love actually. I went to the shop and love the orange flannel rag quilt. I also voted. I follow your blog, checked out the etsy shop and and voted for you! u r climbing up with the votes ... i will continue to vote for you n hope to win this cute blanket. she is so creative and has a great etsy shop! I think some people are a little confused about how many times to enter, where to enter, etc. If I understand correctly we can enter ONE time after doing all three requirements, right? i follow, i voted and i love the hot pink rag quilt! it would be perfect for my baby girl! Already a follower-Great Blog! Voted and checking out the Etsy shop-Very cute! This blanket would be great for our little one! I checked out the shop! Very cute stuff! I checked out her shop, and I am a follower!! So cute...I can't get over how talented she is! Check on all 3! I'm a follower, checked out the shop, and voted! O my heck! These are the cutest blankets ever!!! Love them! Cute sruff! I follow and voted! Checked out her Etsy shop. I loveeee this cute cute blanket!! I'm pregnant with my first so I need EVERYTHING for him! Check, Check, Check. It's got trucks! My older son will love it. I really like the colors on her blankets...and I follow and voted too! Those blankets are beautiful!!!! Oh my! I want one so bad and my baby is a toddler now. I am a follower and voted! Love your blog! I love these blankets! They are so cute! How cute! I'd love to win this! I checked out Sarah's etsy shop and what beautiful blankets. I love the stripes. I checked out her etsy shop. I hope to be able to sew like her one day. I found the perfect gift for my best friend who is having a boy on the bella blanket etsy shop. She will love the plaid owl squares...which is what she is doing her nursery in. I've loved your blog ever since you started it!! Pick me, Pick me!! I voted for you on TopMommyBlogs! I love the owl stiped baby quilt- SO CUTE! I love the plaid owl squared quilt! LOVE IT! Plaid owl quilt is so cute! She makes some really cute stuf! Did all the requirements...including this post. :) These quilts are BEAUTIFUL! Reminds me of the ones my mother made each of my 3 children! First time I've ever seen the rag burp cloth though! Inventive! oh pretty please let me win this one! This is gorgeous! I'd almost feel bad using it to wipe my son's spit-up! These blankets look so fun! I would love to cuddle with my little guy with one! I love this! too cute! I just voted for your blog! Which I love btw! Done, done and done! How fun! check check and check. now all that's left to do is win! Did it, Did it, Did all of it...I love your blog! My little sister is pregnant with her first daughter...I would love to win this for her! Hello, did all that was requested. I love your blog and all your fun giveaways. I have a link to your blog through my blog so all my friends can be love actually addicts too. thanks for all you do.